Thermostatic radiator valves (TRVs) were invented in Denmark and introduced in the Seventies as a cheap and easy way of controlling zoned temperatures throughout a large building with a “wet” heating system fed by one central boiler (the origin of the term “central heating”). TRVs can be useful in commercial buildings such as offices and factories, and are also widely used in apartment buildings in Europe, where one boiler in the basement often feeds dozens of flats. In this situation, the boiler is constantly fired-up and hot water is constantly circulating throughout the pipe network (so that the boiler is operating at optimum efficiency). Individual flat dwellers control their homes’ temperatures using TRVs and quickly learn to judge the correct setting. When steam or hot water needs to flow at all times but some outlets don’t need it, you should go for a thermostatic radiator valve (TRV). This is designed to keep certain outlets sealed when needed without disrupting water and steam flow. 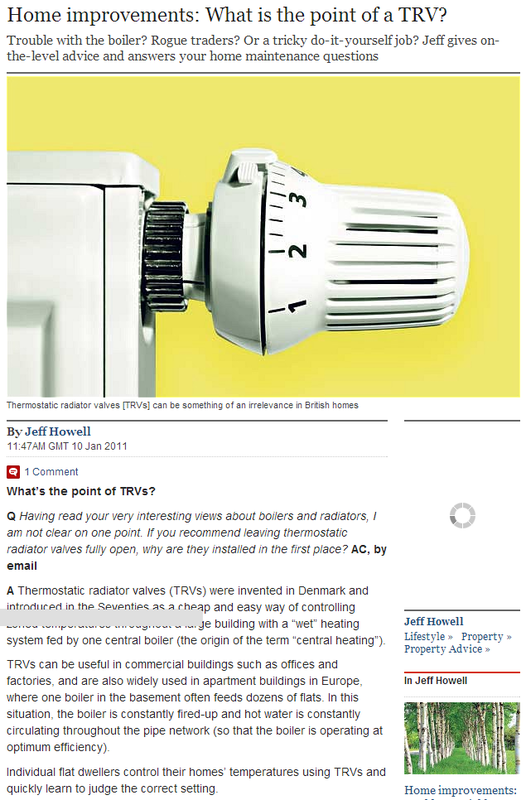 In the residential setting, TRVs make sense when several, separate units share a common boiler. A TRV consists of two main parts: the dial and the valve. By turning the dial to a hotter setting, the seal opens up and allows more heat to pass through. A lower heat setting can help save a lot of energy, and if nobody is around to regulate the valve, the dial usually comes with an optimal setting. The pipes stay filled with steam and hot water to maintain efficiency, while control of how much flows into one room is decided by individual thermostats. Well-known TRVs include high-quality Danfoss valves because of their reliability, and factories and workshops often use this device for their daily processes, while apartments and homes use it for central heating. Large homes can take advantage of this type of device when individual rooms serve different purposes. For industrial purposes, especially those that use steam frequently, TRVs can work well with other tools such as quality Spirax Sarco traps available from supply stores such as ALB Industrial to regulate its flow. Make sure that what you’re buying comes from a reputable supplier because if your product has even the smallest defect or crack, your systems may leak and will need to be replaced.